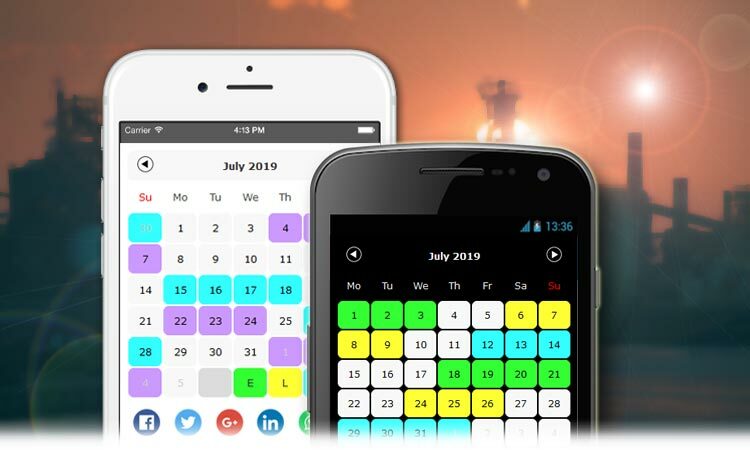 Our shift calendar web apps are suited for phones, tablets and computers running on Android, iOS, Windows, Linux or Chrome. No software required, therefore ideal to share with friends and relatives. Shift Calendar for Windows 10 is a free app for Windows desktops, tablets and mobile and is currently available in the Microsoft Store. Choose from over ninety different shift schedules and more than 10 languages. Create your shift calendar for Excel, Word, html or PDF. For your team or for all teams. You can choose from several layouts and more than 10 languages. Our database contains some widely used schedules and all their corresponding shifts. The main features of each shift pattern are shown in graphs such as the number of shifts per year or per day. Our shift calendar web apps are available in different designs; with a grid layout, in list format or in a continuous list format. Most apps offer the choice between a light and a dark theme and between Monday or Sunday as first day of the week. Can't find your schedule? Search our database. Or use our shift pattern editor. Copyright © 2019 Informedia - All rights reserved.